Police in Haiti's capital have fired tear gas as more than 1,000 protesters rallied to call for President Rene Preval to step down. 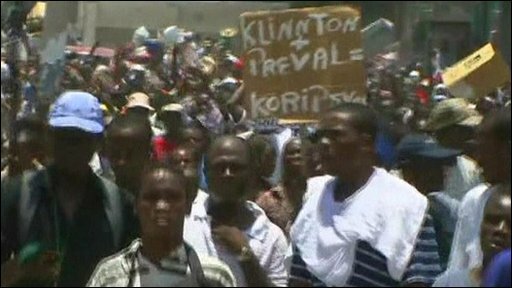 The protest was called in Port-au-Prince by opposition groups angry at what they say is Mr Preval's plan to stay beyond his term. There are concerns elections due by next February may be delayed because of records lost in January's earthquake. The quake killed up to 230,000 people and left one million homeless. The BBC's Nick Davis in Port-au-Prince says some are concerned that the president, who has just been granted 96 more days in office by parliament because of the emergency, is holding on to power. Many electoral records were lost in the quake and many civil servants were killed but opponents say it is still unconstitutional to delay the poll. Our correspondent says the scenes at the protest were initially more party-like, as protesters from every section of society arrived to call for the president to step down. The majority of the crowd were peaceful but in some places the situation proved more tense as demonstrators became more angry with the police, our correspondent says. Some called for the return of exiled former President Jean-Bertrand Aristide. One protester, Herve Santilus, told Associated Press: "[Preval] is profiting from this disaster in order to stay in power." Officers eventually used tear gas and fired in the air above demonstrators, who were throwing stones. Our correspondent says the protesters finally drifted away but promised to be back on Tuesday. He says the mood is that of frustration with the situation in the camps and with the political process in the country.